Key Difference: Vampires are depicted as handsome, charismatic, charming pale human beings that prefer feasting on human blood. Vampires are also depicted as having abilities such as ESP, telepathy, telekinesis and the ability to turn into bats or other animals. Crosses, Wooden stakes, Holy water, certain herbs (vervain), garlic and silver are considered as weaknesses of vampires. Zombies are still depicted as vicious flesh eating creatures. 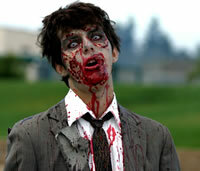 Zombies are corpses that are revived from death, either by magic or drugs. Zombies are most commonly depicted as brain dead, decaying corpses that crave the human flesh and brains. A zombie that bites or scratches another human will pass that person the virus and turn that person in to a zombie as well. Zombies are shown as pale, decaying corpses that do not have the ability to speak, or control over movements as the virus has killed their brains. Zombies can be killed by being shot in the head of decapitation. Vampires and Zombies have become a part of today’s culture and almost everyone knows what they are. The popularity has been fueled by the numerous books and movies published about both mythological creatures. Everywhere you turn, there is movie about either vampires (Twilight series) or zombies (Resident Evil series). These phenomena have fans screaming, swooning and collapsing at packed premiers of romantic vampire movies. Though both these creatures reside side by side in today’s generation, they differ from each other in many ways. Like all mythological creatures, vampires are also a part of our ancient culture. Almost every civilization had creatures that lurked around in the dark and feasted on human blood and flesh. These creatures were most commonly women that seduced men and then drank their blood, even Lilith and her daughters have been depicted as drinking blood from babies. Vampires were made popular from stories such as Bram Stoker’s Dracula, Anne Rice’s Interview with a Vampire, etc; these stories have been said to give birth to the modern vampires. Though originally, vampires were said to be women, now they can have any gender. 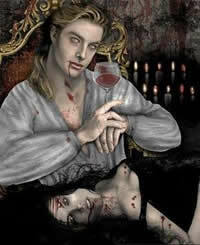 Vampires are depicted as handsome, charismatic, charming pale human beings that prefer feasting on human blood. Though in the olden days they were considered as vicious demons, numerous books and movies have now humanized them, tamed them and gave them feelings. Each writer or author has had the liberty of changing the beings according to their wishes and while some chose to make them more vulnerable to the sun by causing them to burn horrifically; others gave them the ability to glitter. Vampires are also depicted as having abilities such as ESP, telepathy, telekinesis and the ability to turn into bats or other animals. Television shows such as The Vampire Diaries gave the vampires the ability to walk in the sun using magic rings. Crosses, Wooden stakes, Holy water, certain herbs (vervain), garlic and silver are considered as weaknesses of vampires. Zombies are still depicted as vicious flesh eating creatures. Zombies are corpses that are revived from death, either by magic or drugs. According to Vodou in West Africa, nzumbe or zombie can be revived from the dead by a bokor or a sorcerer, and the zombie stays under the control of the sorcerer. Other West African traditions suggest that sorcerers could harness the power of a zombie astral in order for good luck. The astral would eventually fade as God would take the spirit back to the astral plane. Modern zombies were made popular by George A. Romero's film The Night of the Living Dead. Zombies are most commonly depicted as brain dead, decaying corpses that crave the human flesh and brains. A zombie that bites or scratches another human will pass that person the virus and turn them into zombies as well. Zombies are shown as pale, decaying corpses that do not have the ability to speak, or have any control over movements as the virus kills their brains. Zombies can be killed by being shot in the head of decapitation. Though zombie movies are usually made as a horror movie, comic variations such as My Boyfriend's Back (1993), Shaun of the Dead (2004), and Zombieland (2009) have also become popular. Other movies such as I am Legend, Dawn of the Dead, 28 Days Later, etc have portrayed zombies as agile, vicious, intelligent and stronger than the traditional zombies. Popular beliefs that connect with the zombies are the Zombie apocalypse, which is defined as a breakdown of society as a result of an initial zombie outbreak that will spread. The zombies are expected to rise and retaliate on the human civilization which will slowly reduce the society to scavenging pre-industrial hostile wilderness. The recent news stories of a man eating another man’s face on the Miami highway and another 21 year-old-man charged with eating a man’s heart and brain; have sparked rumors that the zombie apocalypse is near. San Diego counter-terrorism summit in October 2012 will also have a zombie apocalypse training scenario as part of their anti-terrorist training. So the questions boils down to this, who would you be willing to face in case of a hostile takeover, vampires or zombies? Jumbie, the West Indian term for "ghost"; Nzambi, the Kongo word meaning "spirit of a dead person. "; Zonbi, Haitian Creole or Louisiana Creole word, with Bantu origins, for a person who has died and been brought back without free will. John Polidori's 1819 novella The Vampyre, Bram Stoker’s Dracula, Anne Rice’s Vampire Chronicles, Charlaine Harris’s The Southern Vampire Mysteries series, and Stephenie Meyer’s Twilight series.